Back with one more interesting post , Today’s topic is ” How To make Children’s Day Special for our Kids “. Children’s Day is something which all kids look forward to as they have lots of fun activities and functions in their school which they really enjoy and is a sweet break from their daily monotonous routine of studies and home works . In most of the schools on Children’s day they have Fancy Dress Competition , Dance Programs , Cultural Activities etc ,which kids love to participate as they are interesting and fun filled . In my daughter’s school they have dance programs on Children’s Day and almost all students are made to participate . Dancing on some Bollywood numbers and wearing colorful and gorgeous dresses makes them happy and thrilled . They want to look their best and the preparation starts weeks before , Rehearsals , finalizing Costumes & Jewelry makes them excited and happy . They Love to perform on stage , getting appreciation from teachers , parents and friends , Loved to get clicked in photo shoots & Video Shoots , so it’s a Fun Filled Activity for them . I do encourage my kids to participate in all such activities as they enjoy a lot and also makes them more confident in facing the crowd . I have also attended few such functions in their school as I also enjoy watching them performing on stage and enjoying every moment of it . But all these Children’s day activity is confined to their school only , as usually Parents do not do any thing special at home . At home usually we are too strict , worrying about their studies , home works , examination preparation etc , and in today’s hectic life during school days we hardly get sufficient time to have some fun with them as we all are occupied with our works . So we should take out some time on weekends , holidays , festivals etc to spend some quality time with them and make it fun filled and enjoyable . To start with Let’s begin with Children’s Day . As it’s a day for kids . Don’t just leave them to have fun at school , bring that fun to your home too . Plan something different for them that day , some thing which can be a Pleasant Surprise . It could be a visit to a Shopping Mall with Lunch or Dinner outside , A trip to some Amusement park , A shopping Spree buying their favorite Toys & Story Books etc , anything which will make them happy and can make the day Memorable . Show them that you are Modern Day Parent who are not Boring but are like their True Friends , trying to be a part of their happiness & excitement . I always try to do something special on Children’s day . Last Year I went to their school to watch & enjoy my kids performing on stage and after that I took them to a Restaurant to have their favorite meal . They really enjoyed a lot . This year I have similar plans with some more additions like I want to give them some Surprise Gifts which they would love to have like some good story books , Activity Kits , Accessories and Chocolates which they love to eat . After that I will take them to my parents house so that they can spend some good time there as they love going there and on weekdays they do not get time to visit there . It’s all about spreading Love & Happiness and making the day Special & Memorable . So let’s Try and make it happen , Make this Children’s Day Special & Memorable for our kids . 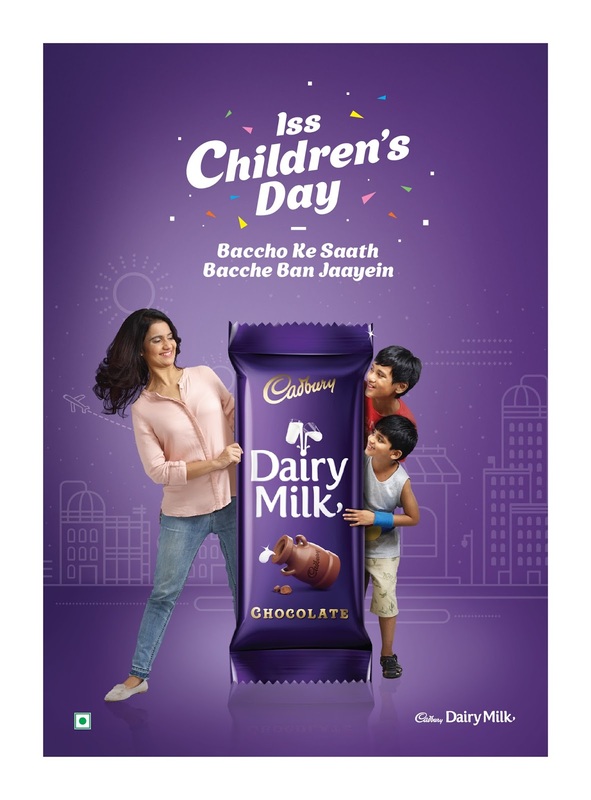 Watch this Lovely TVC where a mom is trying to make Children’s Day special for her kids with Cadbury Chocolates . I Simply Love their Tagline ” Kuch Meetha Ho Jae ” and what Best then Chocolates which kids love to have . Hope you all enjoyed reading this post and found it interesting .